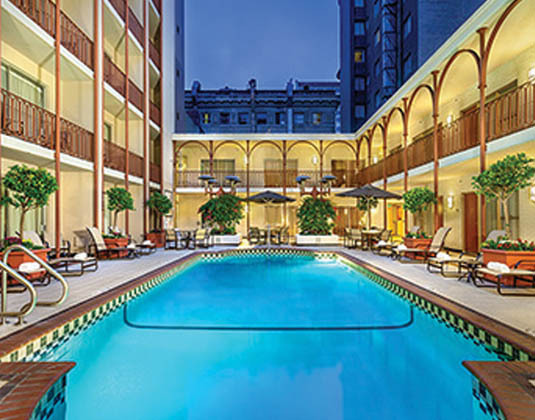 This family-owned hotel, set in the heart of San Francisco at Union Square, welcomes you with personal service, comfortable rooms and a warm atmosphere. Ideally located near main attractions, including the world famous cable car right at the hotel corner, the many shops of fashionable Union Square as well as great dining options. Guest rooms are situated in either the historic or premier sections of the property and are all well appointed. In historic section rooms with TV, hairdryer, tea/coffee maker, mini fridge, safe and iron & ironing board. Some rooms have shower only. Larger premier rooms, many with a balcony. FREE daily American breakfast for two.